Now you can get your new folding electric bike with the FREE optional front and rear fenders at NO extra cost! 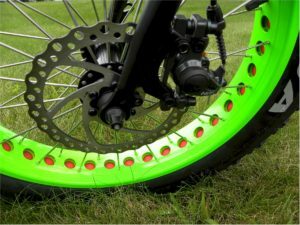 Why Ride a Fat Tire E-Bike? 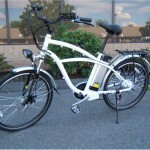 If you are a commuter looking to protect the environment or just a person looking to save money on gas then this e bike is for you. You can easily get around town, avoid traffic jams and enjoy the outdoors on our Electric Bikes. Other great uses for our fat E-Bikes are for hunters, or a rider looking to go places they have only been able to get to on foot before, or someone that’s just up for some beach riding. Premium Kenda Tires to travel in any terrain from paved streets to soft sand, to trail to mud to snow, making this a go anywhere, any season, mode of transportation. 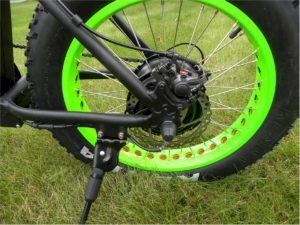 Our patent pending front wheel / all-wheel drive, (adding pedal power), that SAFELY takes you upstairs over curbs and obstacles that might otherwise send you flying over the handlebars with a rear wheel electric system. 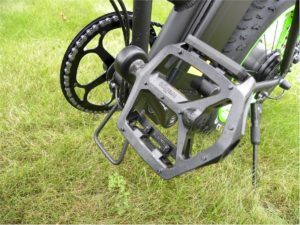 Without power and torque of a front wheel system riding in any soft terrain like snow, sand and mud can allow for the front wheel of a bike to dig in and stop making it extremely dangerous. Top of the line rust-resistant components for extended durability and life of the bike. 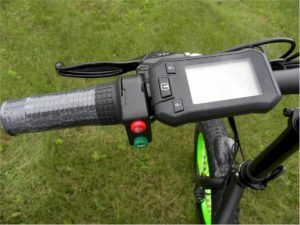 Ability to travel 30 plus miles on a single battery charge. 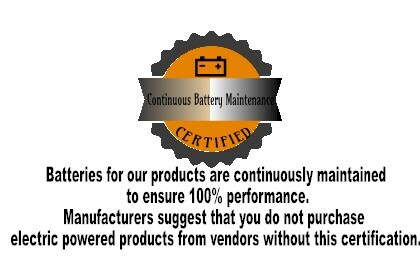 Top quality certified and safety inspected sealed lithium ion batteries that easily remove from the bike for charging and safe-keeping. 1. 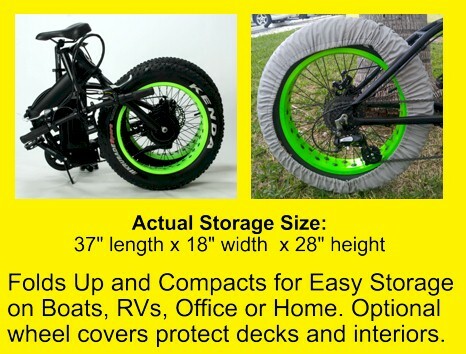 A lighter, faster electric bike with the ability to compactly fold and store in your home, college dorm, apartment, office, on boats or RVs, your car trunk … just about anywhere! Just unfold it and you are ready to go! 2. This is the absolute best green energy commuter bike on the market today … designed for commuting not only on the busy streets of New York City, but any city and in any season, snow or wet icy pavement without having to worry about traffic jams, and parking fees! Don’t live in a big city? Our fat tire, all terrain electric bike can handle a commute on country roads and trails as well. 3. It’s a “no sweat” commute. Arrive “office-ready”; with no need to change from biking attire to office wear. 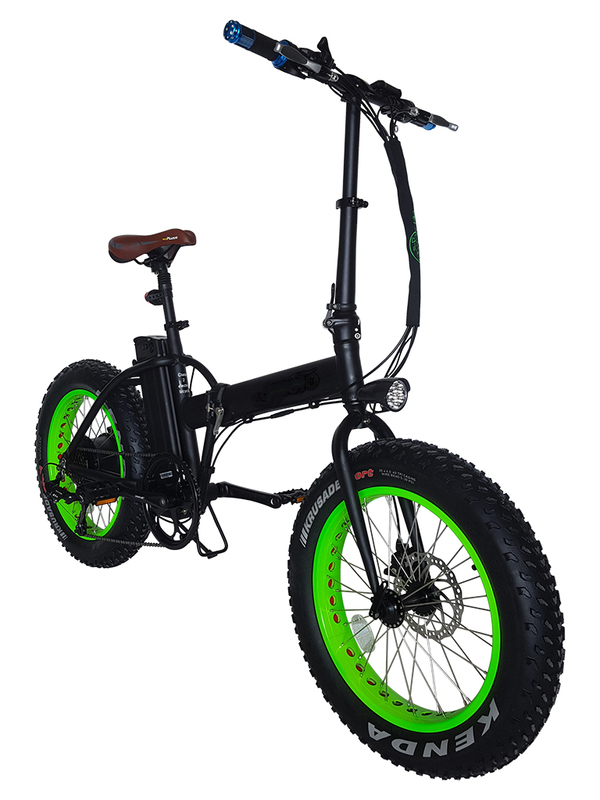 Check out why this folding fat tire electric bike is the BEST on the market! 1/ Sturdy wheels, strong spokes with the advanced disc brake – to take you on and off road with ease. 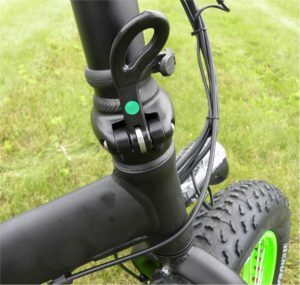 2/ Foldable handlebar – so you can take your bike anywhere, store everywhere. 3/ Sporty, adjustable seat with springs – to save your bottom on off roads. 4/ The right side throttle and the gear shifter – all right at your fingertips. 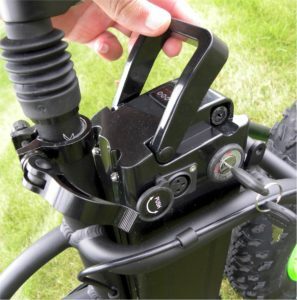 5/ Large pedals – to ensure firm grip. 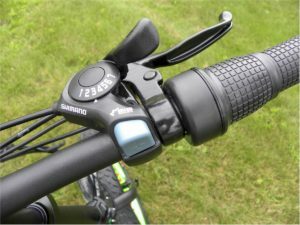 6/ Left side on the handlebar, you can access the display showing the speed, distance and the battery charge. Also the horn and the light switch – very convenient. 7/ The seven speed Shimano – if you need to climb hills. 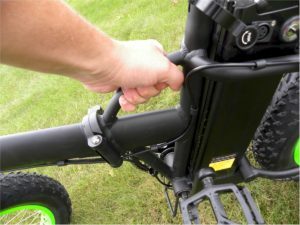 8/ The bike folds right in the middle – so you can put it in your car. 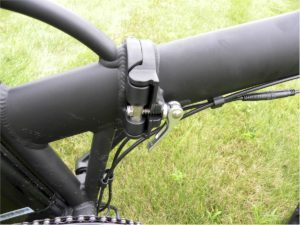 9/ You can also grab your bike by the midbar – specifically designed for that purpose. 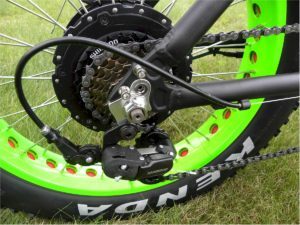 10/ The front wheel with the super strong disc brake – to ensure your stopping power. 11/ The battery is easily removable – just unlock and pull it out. 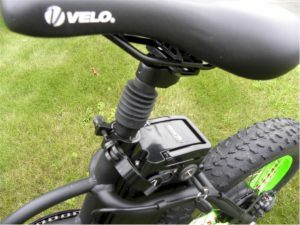 You can charge it on or off the bike. Yes, you can lock the battery so nobody can steal it. NEW! You can choose the PowerPackage to get more Power! This option can be added on the order page. It cannot be added to your bike after it has been shipped.